Peter Pauernschmid was a file maker in Nürnberg in the early 1500's. This is a drawing of him at work in his room at the Mendelschen Zwolfbruderstiftstung (literally, the Mendel's 12-brother's charity home for the aged). This was a brotherhood, or association, that catered to elderly craftsmen. It was founded in the fifteenth century and operated for about 200 years. 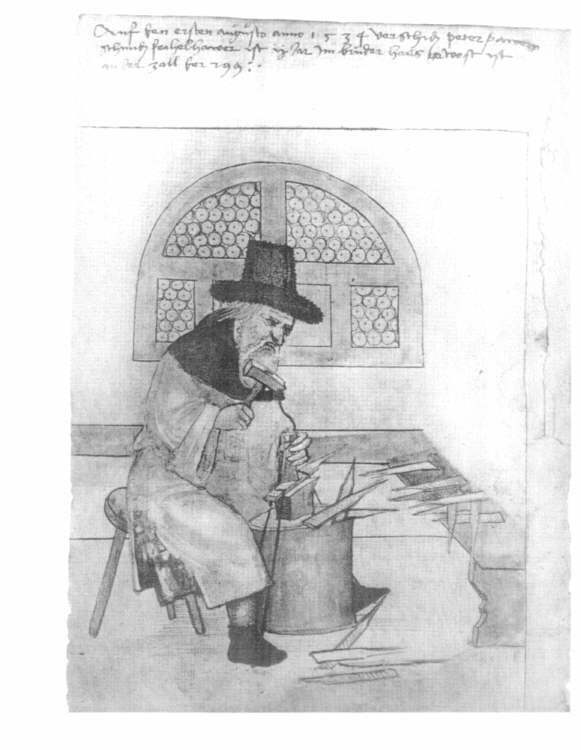 Das Hausbuch der Mendelschen Zwolfbruderstiftstung contains a listing of all of the members and a drawing depicting each resident practicing his trade. This drawing was made sometime in the early 1530's. It is one of the oldest, if not the oldest, picture of a Bauerschmidt still in existence. It is certainly the oldest that we have ever seen. The hand writing at the top of the page says: "auf den ersten augusto anno 1534 vershid Peter Pauernschmid, feihelhauer, ist ii jar im bruderhaus gewest, ist an der zall der 299." Loosely translated, this says: "On the first of August 1534 AD, Peter Pauernschmid, file maker, died; had lived already 2 years in the 'brotherhouse' in room 299." The file maker in high black hat and shirt, sits behind the anvil and strikes blows in the flat file with hammer and chisel. The file is fastened firmly to the anvil on the right and left with 'fastbelts'. In the corner [lie] finished and half-finished files and raw material. In the back wall of the workshop is a broad, round window with five-fold partioning.